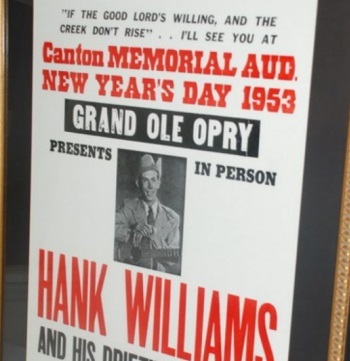 This commemorative poster of the concert Hank Williams never made it to is among dozens and dozens of items up for auction in the Zeek Rewards Ponzi scheme case. The live auctions will open in Lexington on Dec. 16 and 17 and will be simulcast online. Bidders must register at the site of proxibid. The catalog for Day 1 is here; the catalog for Day 2 is here. Read receiver’s announcement of the auction. Visit receiver’s website. Do any of the items to be auctioned come with a “Certificate of authenticity”??…. Why, you’re gonna put one up with a label “Where you scammed in this chair?” or something? Burks was known as the “Singing Magician” and had pretty good Country connections, it seems. This Ponzi phase was a late career change. Could be a market for “Scam used memorabilia”…..Zeek table and chairs….BannersBrokers office partitions….Tri-star coffee cups…))…LOL…. Not gonna be a penny auction is it??? Exotic FX, HYIP Promoted On Ponzi Scheme And Criminals’ Forums By Club Asteria Members, Collapses; Did Club Asteria Also Have Tie To Collapsed Imperia Invest IBC Fraud Scheme?